Ketogenic diets limit products which contain many of the toxins in food discussed below. In particular, wheat, nightshade vegetables and beans contain toxic lectins, compounds which are also insulin mimics in the body. Insulin resistance is at the heart of many of the issues that ketogenic diets fix. It makes me wonder if some of the benefits of a ketogenic diet are rooted in the removal of lectins and other toxic foods from a person's diet. It also makes me wonder about people who don't do as well as some on a ketogenic diet. Are they still reacting to toxins in foods they haven't yet discovered and avoided? On this page, I discuss natural, plant-made chemical toxins. Some of these can be neutralized through proper food preparation techniques (soaking, fermenting or cooking the food), but others are poisonous in any form. Here’s a list of some natural food toxins. 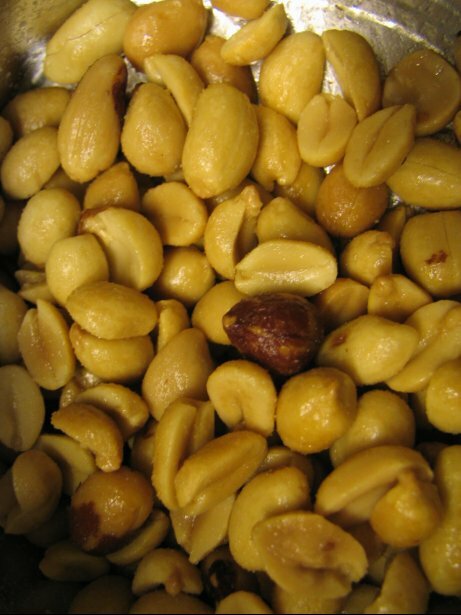 Tree nuts including almonds, pistachios, walnuts, coconuts, and brazil nuts. The toxin can also be found in the milk of animals which are fed contaminated feed. Virtually all sources of commercial peanut butter contain minute quantities of aflatoxin, but it is usually far below the US Food and Drug Administration's (FDA) recommended safe level for toxins in food. These toxins are carcinogenic and can affect the immune system and cause epigenetic alterations. Ergot is a toxin produced when the Claviceps purpurea mold infects rye and other grains. In medieval times, outbreaks of the disease “ergotism” were common and known as St. Anthony’s fire. The name was in reference the severe burning sensations in the limbs caused by vasoconstriction of blood vessels in response to the toxins in foods affected. The vasoconstriction sometimes resulted in gangrene and loss of limbs due to severely restricted blood circulation. The neurological symptoms of an ergot infection included hallucinations and irrational behavior, convulsions, and death. More recent research has shown that ergot and other mycotoxins can affect the gut biome negatively. Lectins are protein compounds which are found in small amounts in many foods. These protein toxins in food cause red blood cells to clot (hemagglutination) and in fact, they are used to type blood, as there are specific carbohydrates to which various lectins bind. (I assume this is the premise which supports the "blood type" diet). Humans cannot break down these proteins in the stomach and they are also able to bind to various carbohydrates on the cells of our gut walls. This binding changes and damages gut cells, and causes the gut wall to "leak" these proteins into circulation which then predisposes us to autoimmune reactions. In addition, these proteins can cause cellular overgrowth (mitogenesis) and inflammatory autoimmune system reactions. Consuming lectin-containing foods (especially if they are raw or undercooked) can be lethal. Cooking neutralizes some lectins to some extent, but this depends on altitude. People living at high altitudes, where water boils well below 212 degrees should cook lectin containing foods in pressure cookers to avoid lectin poisoning. But in particular, wheat gluten and some bean lectins are not destroyed by cooking of any kind. Dairy foods: if the cows producing the milk are fed grains instead of grass (this would include most commercial milk products). Also, A-1 beta-casein milk has lectins which have negative effects on human health. Nightshade Plants: these include most plants in the Nightshade family, including potatoes, tomatoes, eggplant and peppers. Legumes and Beans: (all dried beans, including soy and peanuts and the products made from them). Note that the lethal toxin ricin is made from castor beans, which contain large quantities of a particularly deadly lectin. Raw black beans contain enough lectins to kill rats in one week. More importantly, lectins are insulin mimics. This paper discusses the ability of wheat lectins to bind to insulin receptors on your cells, enabling the transport of glucose into the cell, much like insulin does. The import of this is that even vegetables and nuts, which are staples in a low carb diet, can stall weight loss if they contain active lectins which mimic insulin. This article discusses the health effects of wheat lectin consumption in more detail. Dr. Steven Gundry has written an easy-to-read book called the Plant Paradox which has more information on lectins. There is a companion cookbook on this subject as well. Another good but more technical resource is Pusztai's Plant Lectins textbook. Opioid peptides are proteins which effect the brain and mood. In my opinion, food intolerances are rooted in the gut damage caused by wheat gluten. The damage to the gut then allows for reactions to dairy products and other food proteins that can get through a damaged gut wall. Food-based opioids peptides are a problem if they get through the gut lining. They can alter how a person deals with pain, how one breathes (i.e., asthma), gut performance and mood. Common opioid proteins include casomorphin (A-1 beta-casein in cow milk) and various compounds in wheat. Surprisingly, spinach contains an opioid called rubiscolin, which researchers have found improves learning performance in mice. Go figure. An additional note on the health differences in dairy products from cows with either the A1 and A2 genetic variant: It has been shown in research that the A1 beta-casein in milk from A1 variant cows is associated with higher rates of cardiovascular disease and type 1 diabetes. Something to remember when weighing whether the toxins in food (milk) are good or bad. Phytates and phytic acid are compounds found in many foods, but especially soybeans, whole wheat and rye. In the human gut, phytic acid acts as an anti-nutrient. Phytic acid reduces the absorption of valuable minerals such as calcium, iron, magnesium, and zinc by binding the minerals into an insoluble salt. Relatively high concentrations of phytic acid occur in the following foods: whole grain cereal foods (wheat, rye, rice, oats), nuts and seeds, soybeans, other types of beans, potatoes, artichokes, blackberries, broccoli, carrots, figs, green beans and strawberries. Soaking or sprouting the grain will neutralize much of the phytic acid, except in soybeans, which must be cooked for more than 10 hours at very high temperatures to remove the anti-nutrients. Psoralens are toxins in food products such as celery, parsley and parsnips. These compounds sensitize the skin to the harmful effects of ultraviolet radiation in sunlight, and as such are said to be photocarcinogenic. They are not destroyed by normal cooking procedures (boiling or microwave); thus humans are exposed to appreciable levels of psoralens through the consumption of celery, parsnips and other psoralen-containing foodstuffs. Psoralens are used to treat pigment disorders of the skin and other skin diseases such as psoriasis and nonmelanoma skin cancers. Salicylate or salicylic acid is a chemical that plants manufacture as a method of defense. These substances help plants fight organisms that would cause it to sicken and rot. In people who are sensitive to salicylates, ingesting foods high in these toxins can cause respiratory issues such as asthma and sinusitis. They can also irritate the lining of the nose, and cause skin and gut irritation. Irritable bowel syndrome is strongly linked to high salicylate consumption. Some people get migraines, heart palpitations, and there is evidence to suggest salicylates contribute to hyperactivity in children. Foods high in salicylates include berries, mushrooms, olives, coconut, tomatoes, almonds, curry powder, tea, peppers and zucchini. There's a nice resource here on these toxins in food with comprehensive food lists. And another good resource here. Solanine has both fungicidal and pesticidal properties, and it is one of the plant's natural defenses. The human body converts solanines into a poison called solanidine. Solanine poisoning is primarily displayed by gastrointestinal and neurological disorders. Symptoms include nausea, diarrhea, vomiting, stomach cramps, burning of the throat, heart arrhythmia, headache and dizziness. Hallucinations, loss of sensation, paralysis, fever, jaundice, dilated pupils and hypothermia have been reported in more severe cases. Experts say that a hundred grams of raw potatoes contain between 2 and 13 milligrams of solanine. Experts believe that doses of 200 milligrams of solanine eaten at one sitting may cause problems. Symptoms can be gastrointestinal (abdominal pain, nausea, diarrhea, vomiting) or neurological (apathy, drowsiness, mental confusion, shortness of breath, weak and rapid pulse). You can avoid solanine and another similar toxin called chaconine by avoiding green potatoes. Exposure to light or stress (or even aging) causes a potato to synthesize a green pigment called chlorophyll. Light, stress, and aging also cause the potato to produce chaconine and solanine. The appearance of chlorophyll is a warning that something is wrong with the potato. You should also avoid eating potato peels. About 30% to 80% of the toxins in food potatoes are in the peels. Fortunately, these compounds are not well absorbed by the gastrointestinal system and are soon eliminated in the feces. Trypsin inhibitors include toxins in food that reduce the availability of trypsin, an enzyme essential to protein digestion and metabolism for humans and animals. They are found in abundance in soybeans, and in lesser amounts in raw egg whites and lima beans. 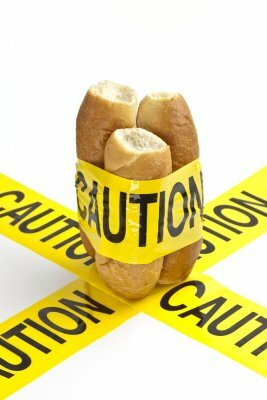 Don't Eat Toxins a blog by Chris Kresser on the most widespread foods which are toxic.